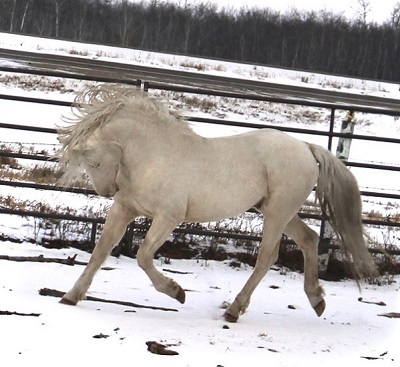 CW'S SILVER SURPRIZE - PEDIGREE PAGE"
Surprize came to Mia-Mar from Celeste Brown of Pine Meadow Farms in Fort Edward, New York. She was purchased while she was heavy in foal, too far along to be travelling such great distances. She arrived later in the spring when her foal was ready to be moved. I wish to thank Celeste for taking care of my new girl for me. She has produced two beautiful fillies for Celeste and I am hoping to get some great foals sired by my Lover Boy. Surprize has never worn leather. I doubt she will wear leather here either, as she is such a wonderful producer, she will spend her days making babies for me.